Science observations by NASA’s Mars rover Curiosity have been suspended for a few days while engineers run tests to check possible causes of a voltage change detected on Nov. 17. “The vehicle is safe and stable, fully capable of operating in its present condition, but we are taking the precaution of investigating what may be a soft short,” said Mars Science Laboratory Project Manager Jim Erickson at NASA’s Jet Propulsion Laboratory, Pasadena, Calif.
A “soft” short is a leak through something that’s partially conductive of electricity, rather than a hard short such as one electrical wire contacting another. A soft short can cause such a voltage change. Curiosity had already experienced one soft short on landing day in August 2012. That one was related to explosive-release devices used for deployments shortly before and after the landing. It lowered the bus-to-chassis voltage from about 16 volts to about 11 volts but has not affected subsequent rover operations. 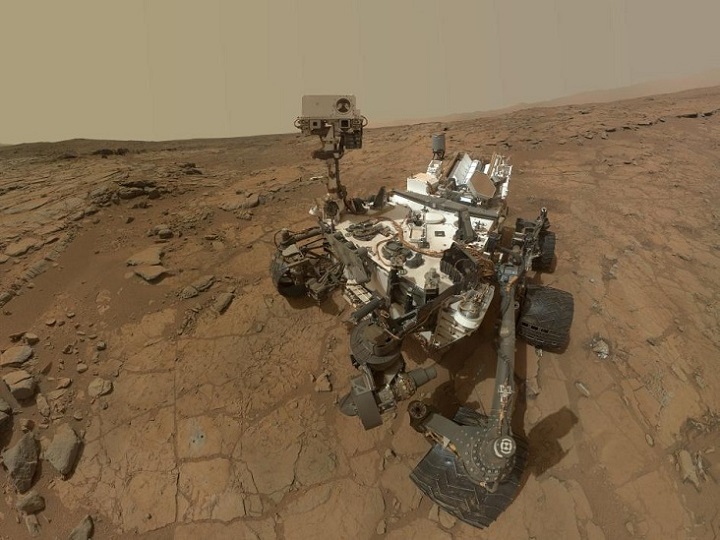 This self-portrait of NASA’s Mars rover Curiosity combines 66 exposures taken by the rover’s Mars Hand Lens Imager (MAHLI) during the 177th Martian day, or sol, of Curiosity’s work on Mars (Feb. 3, 2013). This entry was posted in Mission News and tagged Curiosity, Mars, Mars Science Laboratory, mission, MSL, NASA, rover, spacecraft on 2013-11-20 by Heather Dalton.